Josip Ilicic scored twice and also set up Atalanta’s third from Hans Hateboer. Duvan Zapata also scored, giving the Colombia striker 20 goals in 30 matches to move within one goal of the league lead held by Fabio Quagliarella of Sampdoria. Riccardo Orsolini pulled one back for Bologna, which remained one point from safety. Atalanta is fifth, one point behind AC Milan. 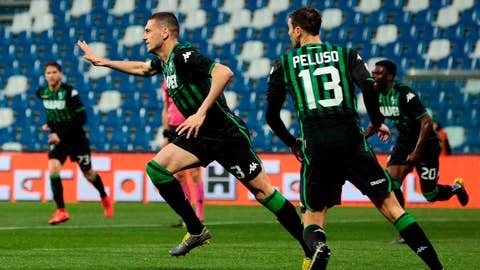 Also, Sassuolo took a big step toward staying up with a dominant 4-0 win over last-place Chievo Verona, which is nearing relegation. Turkey defender Merih Demiral scored a brace with two headers in the first half and Manuel Locatelli and Domenico Berardi added goals after the break. Chievo forward Emanuele Giaccherini had one goal disallowed by the VAR then had a penalty saved by Andrea Consigli near the end. Sassuolo is 11th, eight points above the drop zone, while Chievo is buried at the bottom with only one win.